Kindergartners Graham Garland and William Gedney of Team Acorn. 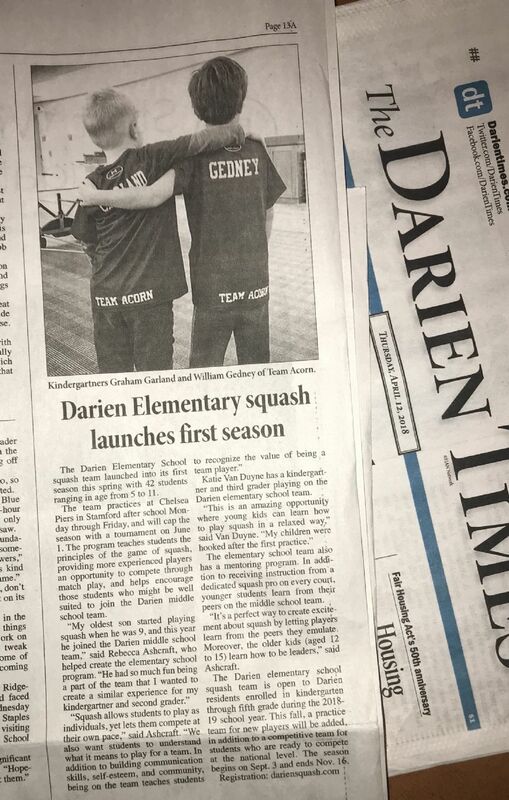 The Darien Elementary School squash team launched into its first season this spring with 42 students ranging in age from 5 to 11. The team, which practices at Chelsea Piers in Stamford after school Monday through Friday, and will cap the season with a tournament on June 1. 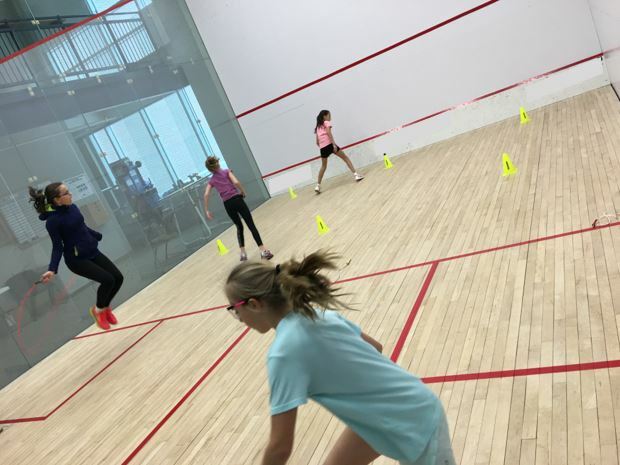 The program teaches students the principles of the game of squash, providing more experienced players an opportunity to compete through match play, and helps encourage those students who might be well suited to join the Darien middle school team. “My oldest son started playing squash when he was 9, and this year he joined the Darien middle school team,” said Rebecca Ashcraft, who helped create the elementary school program. “He had so much fun being a part of the team that I wanted to create a similar experience for my kindergartener and second grader." Katie Van Duyne has a kindergartener and third grader playing on the Darien elementary school team. “This is an amazing opportunity where young kids can learn how to play squash in a relaxed way,” said Van Duyne. “My children were hooked after the first practice." The elementary school team also has a mentoring program. In addition to receiving instruction from a dedicate squash pro on every court, younger students learn from their peers on the middle school team. "It’s a perfect way to create excitement about squash by letting players learn from the peers they emulate. Moreover, the older kids (aged 12 to 15) learn how to be leaders,” said Ashcraft. The Darien elementary school squash team is open to Darien residents enrolled in kindergarten through fifth grade during the 2018-2019 school year. This fall, a practice team for new players will be added, in addition to a competitive team for students who are ready to compete at the national level. The season begins on Sept. 3 and ends Nov. 16. PRINCETON, N.J. -- Columbia’s Osama Khalifa and Princeton’s Youssef Ibrahim earned the Ivy League men’s squash postseason awards following a vote of the Ancient Eight head coaches. Columbia’s Jacques Swanepoel was named the Ivy League Coach of the Year, Columbia senior Osama Khalifa was selected as the Player of the Year and Princeton freshman Youssef Ibrahimwas tabbed as the Rookie of the Year. Khalifa went 11-2 on the year—10-2 at No. 1 and 1-0 at No. 2 for the Lions—en route to his third-straight Ivy League Player of the Year and fourth-straight unanimous First Team All-Ivy nod. The Cairo, Egypt, product also went 6-1 in Ivy League play. Khalifa is the reigning CSA individual national champion. Ibrahim spent his freshman season in the No. 1 slot for the Tigers, compiling a 12-3 record. The Cairo, Egypt, native went 6-1 at No. 1 against Ivy League opposition. Swanepoel guided the No. 2-ranked Lions to a 14-1 record and their first-ever Ivy League title. Columbia posted an unblemished 7-0 mark in Ivy League play, highlighted by its first-ever win over Harvard, 5-4 on Jan. 14. 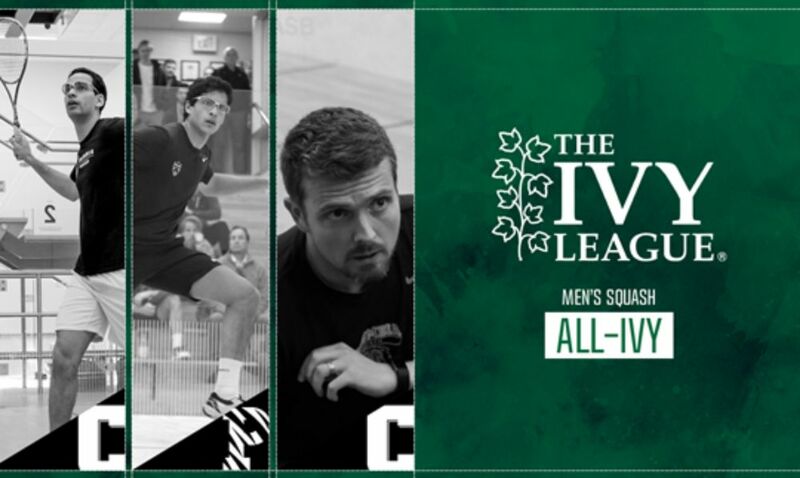 Six Ivies were unanimous First Team All-Ivy selections: Khalifa, Columbia freshman Velavan Senthilkumar (Salem, India), Dartmouth senior Alvin Heumann (Southport, Conn.), Harvard sophomore Saadeldin Abouaish (Cairo, Egypt), Harvard sophomore Timothy Brownell(Belmont, Mass.) and Ibrahim. Harvard, the Ivy League runner-up, earned three First Team All-Ivy nods—Abouaish, Brownell and sophomore Sean Hughes (Newton Square, Pa.). Ivy League champion Columbia claimed two First Team All-Ivy slots with unanimous selections Khalifa and Senthilkumar. Princeton—Ibrahim and sophomore Adhitya Raghavan (Chennai, India)—and Yale—sophomore Spencer Lovejoy (Branford, Conn.) and freshman Harrison Gill (Darien, Conn.) also had two First Team All-Ivy honorees. Penn was represented by First Team All-Ivy freshman Andrew Douglas (Brooklyn, N.Y.). The girls varsity and junior varsity squash teams took part in the Fairwest Squash Tournament on January 28th at Yale University in New Haven, Connecticut. The teams took part in two matches each. Varsity played Greenwich and New Canaan and JV played Rye Garnet and Rye Black. Both teams took a win and a lose, with JV coming in 4th for their league, winning to Rye Garnet and losing to Rye Black, and Varsity coming in 5th with a win against Greenwich and losing to New Canaan. “It was a really fun match because it's such an awesome team and its nice to have a tournament with JV because we never do. 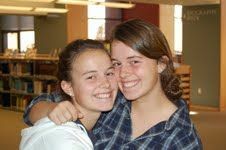 Everyone played great,” says junior, Alexa Cornacchia, Captain of Varsity Squash. Varsity Girl will be attending Nationals in Philadelphia, PA. on February 1st along with Varsity boys. JV will be having a scrimmage on January 31 at Chelsea Piers. Be sure to check out the matches! The Darien Boys Varsity Squash season opened up this year with a disappointing loss against Hackley School in Tarrytown, New York. Following was a win against New Canaan High, Greens Farms Academy, and Rye, along with a loss to Brunswick and Bronxville. Last weekend, while up at Salisbury, the team took a victory over the home team, but a loss to Hotchkiss, who was also playing up there. Saturday is the Fair West Cup, in Stamford, and we end our season with Nationals in Philadelphia the weekend of February 1st. Seniors Dillon O’Shea, Albert Nguyen, and Charlie Baylis lead the team this year as captains in the footsteps of the nation’s former number one player, Harrison Gill, as he continues his squash career at Yale University. It is no secret that Darien is a sports-crazy town. Nationally ranked teams at Darien High School, youth sports programs with enormous rates of participation, and now a brand new set of state of the art stadium lights. Typically sports like football, lacrosse, hockey, field hockey, or volleyball are the first sports to come to mind when thinking about Darien. But a group of students at DHS are trying to grow another sport: squash. And their goal is much more lofty than simply raising participation levels in Darien. The goal is to raise participation levels in communities all across the region, starting specifically with Darien, Norwalk, and Stamford. “Initially, I came up with an idea to focus on squash in the Darien-Stamford-Norwalk area. My goal was to participate in fund- raising, where I would raise money to help underprivileged people play squash. For example, I would ask for donations of money, sports clothing, squash gear like rackets, shoes, squash balls, squash glasses, wristbands, or spare squash grips,” said Albert Nguyen, one of the originators of the idea of this urban squash league. More than just finding gear, the goal includes the creation of a network so that squash players can find others to play with. 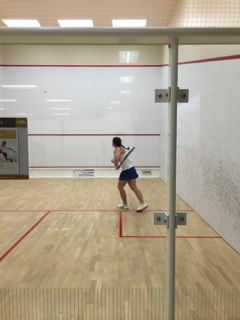 “I also wanted to make my organization so that people could email me or any other member of the current squash team for a simple hit, lesson or practice session. As long as anyone wanted a hit, he/she would be welcome. It would be any day of the week that we would be available at where this would be posted on emails or social media,” said Nguyen. Nguyen would find that a teammate of his, Sophia Cortellesi, had already gotten the ball rolling on the idea to start a squash organization. “Sophia had gone to a community center in Stamford and brought a couple of kids to play at the Sportsplex in Stamford on Saturdays. She has also started the initiative of providing a STEM oriented program to her squash activities,” said Nguyen. Nguyen also credits the Darien Depot for helping him come up with the idea. “Without Janice and the support of Darien Depot, I would not have been able to start my plan to make squash more popular in the Darien community,” said Nguyen. Cortellesi explained that the inspiration came following a match between Darien and Squash Haven. Now, the new organization is looking to grow. Thanks to generosity from coach Kumail Mehmood, the group uses SportsPlex in Stamford. “We play at Sportsplex in Stamford on Saturday afternoon. Kumail Mehmood generously donates courts and equipment to run our program,” said Cortellesi. Cortellesi added that Mehmood and the rest of the SportsPlex staff have been an instrumental part of setting up and building this program. “The joining of their two ideas has been a strong match. “We have merged to make our organization truly functional, I would focus more heavily on fundraising, as well as adding in my idea of not just Saturdays, but possibly every day being a possibility for anyone to play squash with the Darien High School Squash Team,” said Nguyen. As they grow, both Nguyen and Cortellesi said that they’d love to get more help from others in the community who love squash. “People who love squash can come and help us teach the kids on Saturdays. We are helping squash grow by creating awareness and love for the sport in the underserved communities,” said Cortellesi. Nguyen added that he plans on placing a donation box outside The Depot for people in the community to donate equipment and supplies. Nguyen said he hopes that other people are able to have the same sensation he had when he first picked up a racket. “When I played it, I can say it was one of the most memorable things I had ever done,” said Nguyen. Nguyen encouraged anyone who was interested in getting involved or learning more to reach out via email at or contacting Cortellesi at about her Saturday sessions. “I hope to enhance the game of squash in our community,” said Nguyen. Harrison Gill has been recruited by Yale. 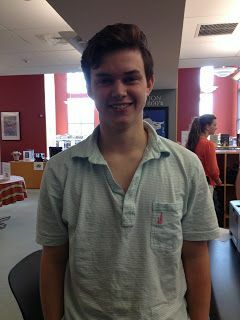 Darien High senior squash team captain Harrison Gill is not a typical teen, as seen by the people who know him best. His success both on and off the squash court can be attributed to many smart decisions, and winning qualities. The FCIAC Scholar-Athlete, Yale-bound squash powerhouse Gill is the whole package in a scholastic athlete. The youngest of five children, also including standout athletes at Darien, Gill began playing squash at the age of seven, with the tremendous support and camaraderie (and competition!) of his family, all gifted and enthusiastic squash players themselves. He played regularly and soon became a force to be reckoned with, by winning a U13 National Championship at age 12. Gill’s trajectory rapidly progressed to bring him where he is today, competing on a national and international stage. Gill trains and plays year round, and has a few important rituals that he feels crucial to his overall success. Extensive pre-hydration, a thorough mental check list including, visuals, strategy implementation, and positive mindset allow him to execute physically on the court, once all the mental check list items are out of the way. “I don’t focus on the other player, I focus on strategy implementation, and play with no fear,” said Gill. What advice would Gill give to young squash players? “You have to play as much as you can,” he said, referencing Outliers author Malcom Gladwell’s theory of consistent practice and extensive exposure. He also attributes success to his work with coach Kumail Mehmood, with whom he has worked for 10 years, as an integral component of his success. Gill contends that squash has evolved greatly, even in his short time, with children beginning at a far younger age, in addition to overall increased interest and awareness of the sport. College recruitment for squash players has increased dramatically as well. Gill went undefeated all season for the Wave. 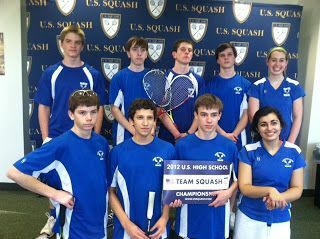 The DHS boys and girls varsity squash teams competed in High School Nationals in Hartford on February 10-12. This was a great way for us to end the season. Both teams finished in the top half of their divisions, thanks to key wins from seniors. Nationals is the largest squash tournament in the world of any kind. 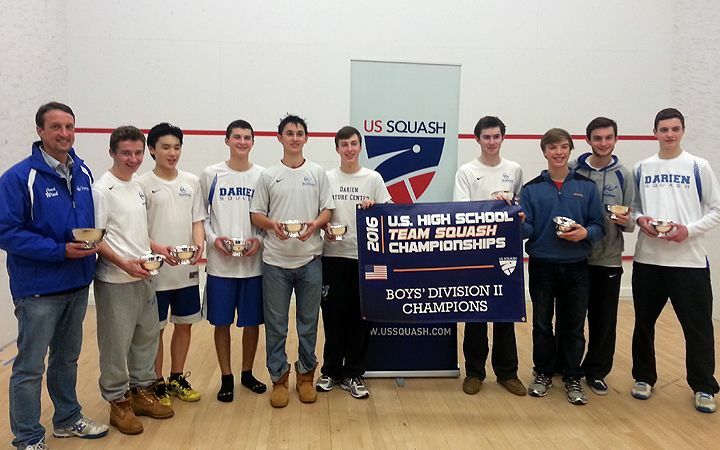 And Darien cemented its long-standing position as the top public school squash program in the country there. Boys Team, left to right: Coach Patrick Wind, Albert Nguyen, Walker Wind, Sean Collins, Alex Cohen, Will Granath, Charlie Baylis, Dillon O’Shea, Harrison Gill, Henry Sparkman, Coach Hugh Underhill. In the decisive match for the boys against Conestoga, captains Harrison Gill and Walker Wind came through with big wins, along with junior Albert Nguyen. Senior Alex Cohen gave the most determined performance of the weekend, coming from behind to clinch the deciding match. The girls team, led by seniors Mia Dursht, Lilly Johnson, Grace Feingold and Sarah Bowditch, had one of its best finishes ever. Girls Team, back row, left to right: Coach Patrick Wind, Sarah Bowditch, Sophia Cortellesi, Julia Tong, Taylor Richards, Alexa Cornacchia, Grace Feingold, Lilly Johnsen, Mia Dursht, Coach Hugh Underhill; Front row: Schuyler Coughlin, Quincy Balanoff, Alix Platt, Elle Mitrano. Sophia Cortellesi and Julia Tong had the distinction of winning all three of their matches. The teams were coached by Patrick Wind and Hugh Underhill. Standing left to right are Charlie Baylis, Dillon OÃ¢â‚¬â„¢Shea, Albert Nguyen, Henry Sparkman, Alex Cohen, Coach Patrick Wind; kneeling with trophy, captains Harrison Gill and Walker Wind. 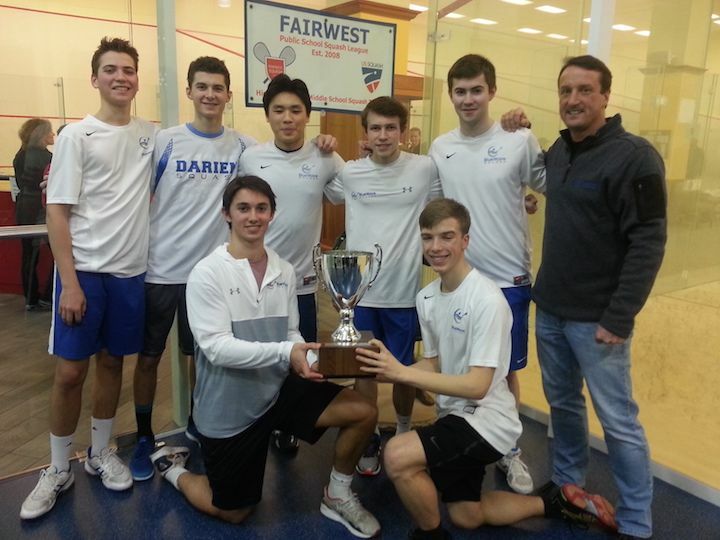 The Darien High boys squash team continued its dominance of the Fairwest league, winning the trophy Chelsea Piers on Jan. 29. High School Nationals will take place Feb. 19. Mia Dursht is having a fine season. 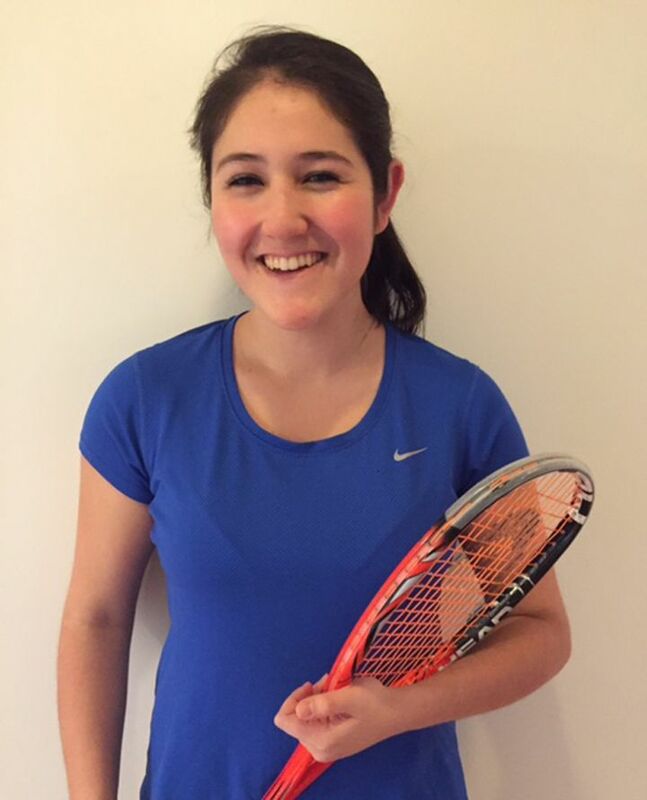 Darien High girls’ squash team captain Mia Dursht has been awarded the FCIAC Scholar-Athlete of the Month Award. She is a multi-year captain and the No. 1 player on the team. Dursht is all of this. This award is presented by the Commissioner of the Fairfield County Interscholastic Conference to recognize student athletes that demonstrate outstanding sportsmanship as well as outstanding academic performance. Dursht was awarded for her performance in Dec. The DHS boys and girls varsity qquash teams were invited to compete in the season opener Poly Prep Invitational Tournament in Brooklyn on Saturday, Dec. 3. Both teams came away with strong results as they prepare for the Fairwest League matches, which take place Monday and Wednesday evenings at Chelsea Piers through January. The season ends with the High School National Championships in February at various venues in the Hartford area. In addition to the many private school teams they will be facing, the boys will be looking to extend their Fairwest League dominance among CT/NY teams and to defend their Division II National title. They have lost only two seniors, Toby Hansford and Connor Wind. Led by captains Harrison Gill, Walker Wind and Will Granath, the line-up will include Dillon O'Shea, Albert Nguyen, Henry Sparkman, Alex Cohen, Charlie Baylis and Sean Collins. The Girls are led by captains Mia Dursht and Sarah Bowditch. Durst clinched a win in the Brooklyn tournament with a determined performance when the team match was tied at 3 - 3. Team Coaches are Patrick Wind and Hugh Underhill. "We are thrilled that DHS Squash has firmly established itself as the top public school program in the country,” Wind said. "And many team alumni have played for or are currently representing some of the top U.S. colleges." On Saturday, December 3rd, the Boys and Girls Squash Teams had their season opener at the Poly Prep Invitational Tournament in Brooklyn. Seniors captain for the girls team Mia Dursht said, “We played two very strong teams right away, with our only win coming from freshman Schuyler Coughlin, our number five player. Our final match was against Brearley and it came down to the final match that went to a fifth game. We ended up winning that one 4-3 to get our first win of the season which was really exciting.” Senior captain for the boys team Walker Wind said, “Our team did really well and we are very happy that we got second place and beat the second best public school team in the process which was great. We had some really good showings throughout the ladder, with senior Harrison Gill at the top and strong performances from juniors Dillon O’Shea and Albert Nguyen.” The Girls Squash Team’s next match is against Rye on Monday, December 19th at 8:30PM at Chelsea Piers. 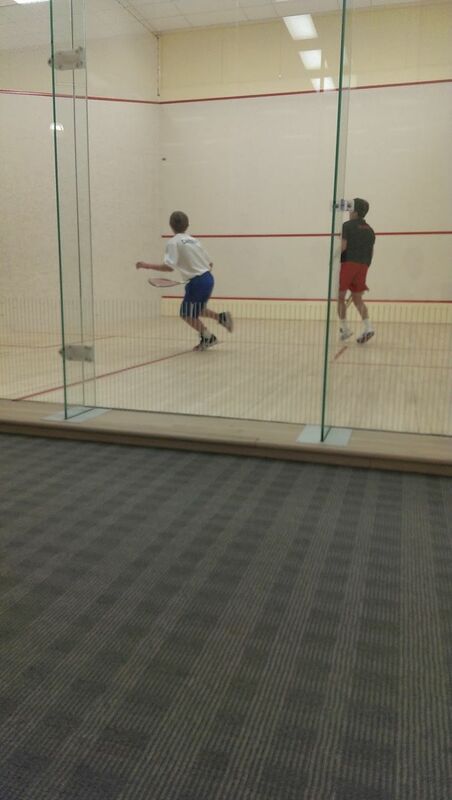 The Boys Squash Team’s next match is against Bronxville on Wednesday, December 21th at 7:00PM at Chelsea Piers. The Darien boys’ and girls’ varsity squash teams were invited to compete in the season opener Poly Prep Invitational Tournament in Brooklyn on Dec. 3. Both teams came away with strong results as they prepare for the Fairwest League matches, which take place Monday and Wednesday evenings at Chelsea Piers through Jan. The season ends with the High School National Championships in Feb. at various venues in the Hartford area. They have lost only two seniors, Toby Hansford and Connor Wind. WAVE BOYS SQUASH — From left are coach Patrick Wind, Sean Collins, Charlie Baylis, Alex Cohen, Dillon O’Shea, captain Walker Wind, captain Harrison Gill, captain Will Granath, Henry Sparkman, Albert Nguyen, coach Hugh Underhill. Led by captains Harrison Gill, Walker Wind and Will Granath, the line-up will include Dillon O’Shea, Albert Nguyen, Henry Sparkman, Alex Cohen, Charlie Baylis and Sean Collins. The girls are led by captains Mia Dursht and Sarah Bowditch. Dursht clinched a win in the Brooklyn tournament with a determined performance when the team match was tied at 3-3. Coaches are Patrick Wind and Hugh Underhill. 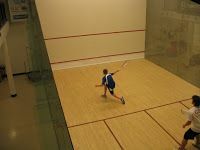 For more information on Darien’s Squash program for the high school and middle school, visit dariensquash.com. The Blue Wave Boys Squash team usually flies under the radar, but it is one of the most accomplished group of athletes for its size. Last year, the team went undefeated in the Fairwest League (their version of the FCIAC), and won Division II nationals, an incredible achievement for a Darien team. The boys are ranked 17th in the nation, and hold the spot as the best public school team in the country. Senior captains Harrison Gill, Will Granath, and Walker Wind hope to lead the Wave and leave the same wake behind as in the 2015 season. Harrison Gill is a champion player, ranked number 3 in his division for the US, and is certainly a paradigm for the team this season. Up and coming players include juniors Dillon O’Shea and Albert Nguyen, who will look to fill the (court) shoes of the seniors next year. A common misconception is that the squash team is co-ed. The two teams are separate, but certainly share technique and passion for the sport. More to come from “Squash Alley” this season, so stay tuned! Susan Alptekin, Kyra Balenzano, Claire Borecki, Elizabeth Borecki, Katherine Cunningham, James Fay, Indira Flores, Harrison Gill, Malcolm Hamilton-Hall, Ben Hayes, Katherine Huffert, James Johnson, Valerie Le, Timothy Luz, Brendan Mahoney, Catharine Morgan, Caleigh Morr, Laura Murphy, Madeleine Ostertag, Jensen Peters, Emily Roberson, Colin Shaughnessy, Johnathan Stimpson, Emily Torrente, Candice Wang, Keenan Warble, Samantha Wind, Walker Wind and Griffin Xie. A Letter of Commendation from the National Merit Scholarship Corporation (NMSC), which conducts the program, will be presented by Mrs. Dunn to these scholastically talented seniors. Approximately 34,000 commended students throughout the nation are being recognized for their exceptional academic promise. Although they will not continue in the 2017 competition for Merit Scholarship awards, commended students placed among the top five percent of more than 1.5 million students who entered the 2017 competition by taking the 2015 Preliminary SAT/National Merit Scholarship Qualifying Test (PSAT/NMSQT). “The young men and women being named Commended Students have demonstrated outstanding potential for academic success,” commented a spokesperson for NMSC. The DHS boys varsity squash team at the High School Championship award ceremony (left to right): Coach Patrick Wind, Toby Hansford, Albert Nguyen, Dillon Oâ€™Shea, Harrison Gill, Connor Wind, Alex Cohen, Walker Wind, Quinn Hagen and Jack Baylis. 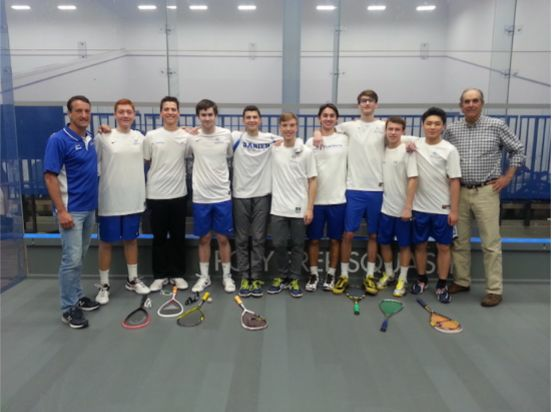 The Darien boys varsity squash team lived up to expectations and ended its season with a National Championship and continued its dominance as the top public school in the country. This was icing on the cake. Unbeaten in the regular season against local opponents in the Fairwest Division, the sport’s equivalent to FCIAC, the team won all of its tournament matches in Division II at High School National Championships in Philadelphia on Feb. 12-14 to capture its first national title. Darien sent three teams to the event and also saw strong performances from the boys’ JV and girls’ teams. The varsity was led by captains Harrison Gill, Toby Hansford and Connor Wind, the top three in the seven player line-up. The final against St. Paul’s School was a close battle and tied at 3 – 3 with one encounter remaining. Playing at the number four position, sophomore Albert Nguyen lost the first game in his best of five match. He took the second game to even the score, and then incited the packed gallery to get involved in the drama, with the Championship on the line. By upping the ante and displaying total confidence in his game and the outcome, he took the next two games to seal the deal. The players above are (from left) Caitlin Flynn, Michael DiMeglio, Schuyler Coughlin, Isabelle Garrett, Noah Hagen, George Kroll and Clifford Blaze. McKenzie Oâ€™Shea is not pictured. 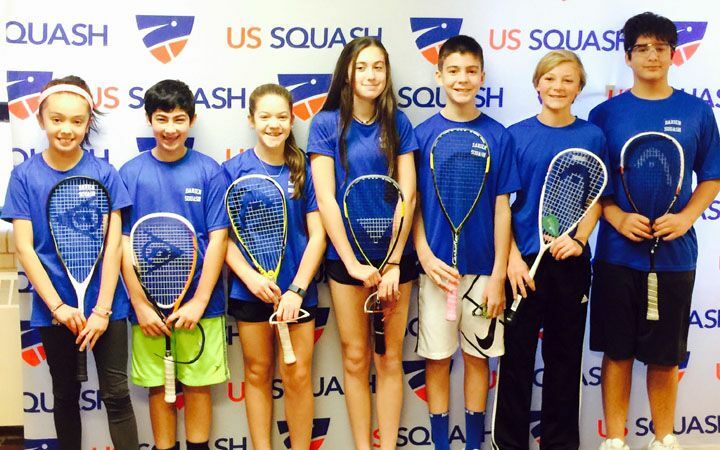 The Darien Middlesex Squash Team competed in the U.S. Middle School Team Squash National Championship at Yale University in New Haven this year. The team, comprised of 6-8th grade girls and boys, won Third Place in their division. The team is currently recruiting both beginner and more advanced players for the next season which begins in the fall. The DHS boys varsity squash team includes (left to right): Jack Baylis, Quinn Hagen, Alex Cohen, Albert Nguyen, Walker Wind, Captains Toby Hansford, Harrison Gill and Connor Wind, then Dillon OÃ¢â‚¬â„¢Shea and Coach Patrick Wind. Blue Wave boys’ squash is making its move. In its ninth year as a varsity sport, Darien is now firmly established as the No. 1 public school team in the country. This year’s challenge will be to take on the top private schools, that have long dominated the sport. The season is off to a strong start at 5-1. Darien is so far unbeaten in its Fairwest Division, the sport’s equivalent to FCIAC. The focus is the High School National Championships in early Feb. where nearly 200 teams meet in Philadelphia to compete. Darien’s goal is to earn a spot in the Division 1 bracket and to finish in the top 10 in the country, up from top 40 the last three years. The team is led by captains Harrison Gill (Jr.), Toby Hansford (Sr.) and Connor Wind (Sr.), the top three players in the line-up and all nationally ranked. Many of the current players started playing in the Middle School program and developed into strong players on the varsity team. What really motivates Wind is not just the results of the matches but the positive impact he sees the sport having on the lives of the students. 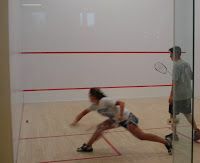 Visit www.dariensquash.com to follow the team’s progress. 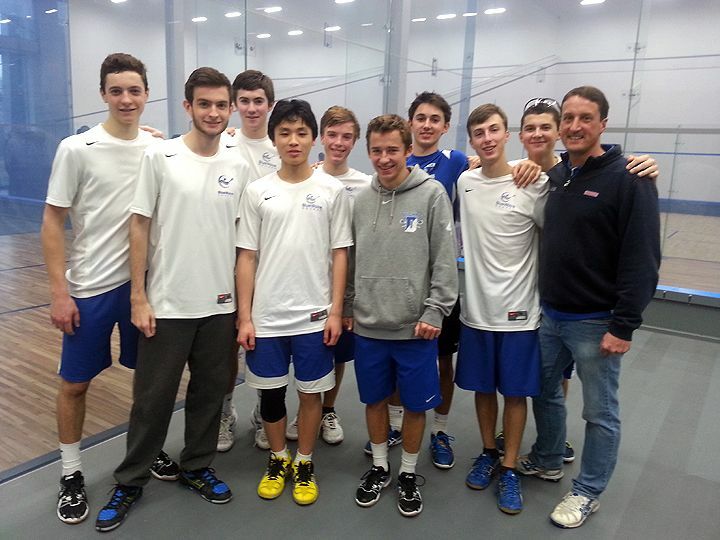 The Darien HS Squash team participated in the 2014 U.S. High School Team Squash Championships in Philadelphia this past weekend. The next few years will be an exciting time for our team as we are growing stronger each year. Darien sent 28 players on three teams: Varsity Boys, JV Boys and Varsity Girls. There were 151 high schools represented and 1,403 players that participated in the largest squash tournament in the world. Darien’s Varsity boys and girls teams participated in Division IV and the JV boys played in Division V. The Boys Varsity team won the Consolation Final and placed 9th overall in their division, losing only one team match. The Girls Varsity placed third overall in their division, also losing only one team match. Both were outstanding placements for these teams. The Boys JV team came in 12th place overall in their division. The Varsity team was led by freshman Harrison Gill and sophomore captain Toby Hansford. Gill and Hansford are both nationally ranked junior squash players in the U.S. Squash U17 division; both top 20 players in the country. Both won all three of their matches helping the team clinch its ninth place finish. Team No. 3 player Connor Wind also contributed by winning two out of three of his matches. Walker Wind, James Teschner, captain Zach Basu, Matt Gregory, captain Nick Cohen, Andrew Morgan and Charlie Brooks all played extremely well and helped the varsity team finish strong. Girls co-captains Haley Close and Caroline Granath along with Tory Cornacchia helped lead the team to their outstanding finish. Catherine Hatfield, Katie Lashendock, Mia Dursht, Nicole Gagne, Emily Van Ingen, and Anabel Brown rounded out the roster and contributed to the team’s success and victories in Philadelphia. The boys JV team placed 12th in Division V with outstanding play by R.J. Clasby, Jack O’Shea, Connor Brown, Alex Cohen, Jack Baylis, Will Granath, Billy Platt, Jack Wells and Pablo Castro. 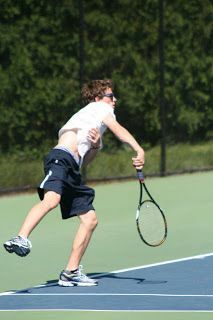 Freshman Walker Wind playing in a match earlier this season. On Wednesday, January 29th, the Boys Varsity Squash team finished their regular season with a win against Fairfield Ludlowe in their last game before nationals. As Ludlowe is a relatively inexperienced team, two of Darien's top players, sophomores Toby Hansford and Connor Wind, sat out during yesterday’s matches. The rest of the team won all seven singles matches of the night for the first time all season, making their record 2-3. With Nationals just one week away, confidence is running high amongst the Varsity Boys. Next Friday, February 7th, the team will be headed to Philadelphia, Pennsylvania for High School Nationals for the first time in the club’s history. Senior Zach Basu speaks to the team's excitement to attend Nationals next week, saying, “Most of the teams that compete are private schools from a few Illinois schools, the Northeast, and some random states across the country.” Considering that squash is historically dominated by private schools, it is an accomplishment for the team. While the team may not expect to win, the boys are enthusiastic about being able to participate in the event amongst many private schools from around the area. The team’s top players, freshman Harrison Gill and Hansford, are ranked number 14 and 16 nationally in the Junior U19 division, and the team looks to the two for leadership on the court, even though they are both underclassmen. After a successful final game of the season, the boys' enthusiasm and confidence is high headed into their last week before Nationals. Darien High School’s Boys Varsity Squash team took on Greenwich High School at Chelsea Piers on Wednesday the 18th in the second matchup of the season. The Blue Wave was looking to bounce back after last week’s upset loss against Bronxville High School. Though the Wave was without #1 freshman Harrison Gill, who sustained an injury in a US Open tournament, the depth of the team was unbeatable. Sophomore Connor Wind and senior Zach Basu, who played in the #2 and #5 spots, respectively, remained undefeated on the season, both winning their matches in a three set clean sweep. Sophomore Toby Hansford, freshman Walker Wind, and senior James Teschner all chalked up their first wins of the season. Senior Andrew Morgan tested his Greenwich opponent in a nail-biting five set match, coming up just short. Fortunately for the Wave, the loss didn’t matter as the team won by a final score of 5 games to 2. Senior captain Zach Basu said of the match, “The fact that we were able to win without a lot of our key players is a testament to the depth of the team.” Underclassmen make up the majority of the top 5 so the future is bright for Blue Wave squash. Darien’s next matchup will be on January 1st at Chelsea Piers against rival New Canaan High School. Senior Jonathan Gill makes a return after a six month break from squash. After playing the sport for years, he took time off to renew his interest and passion for the sport. Senior Jonathan Gill began playing squash when he was six years old, inspired by his father’s past success as a squash player. Four years after he first picked up the racket, Gill began competing in tournaments across the nation. His passion for the sport also led him to share his skills with others as a squash camp counselor and coach. The highlight of Gill’s career so far was during his junior year when he represented the US against Canada in Ontario. Gill and his team beat the Canadian team 3-2 in the under 17 division. 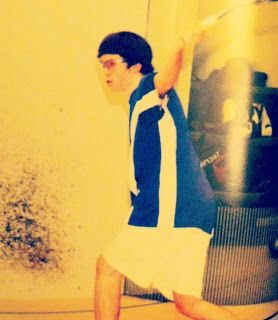 While the highlight of his squash career was only last year, Gill was successful as a sophomore and made the quarter finals and won three of the Junior Champ Tournaments, finishing second place in the nation. Besides his national and international games, Gill has fond memories of playing squash at nearby colleges such as Princeton. “My best memory was reaching the semifinals of a big tournament at Princeton two years ago when I beat the number one kid in the US,” said Gill. Although Gill says the highlight of his career occurred during his junior year, his record shows promise for a strong future in squash at Columbia University this fall. Senior Carl Stowell is usually known for his performance as first basemen for Darien High School’s Varsity baseball team, but during the winter, it is a whole other ball game. Literally. Stowell plays Varsity Squash for the Blue Wave, a unique sport that not many DHS students know about. Squash is a relatively simple sport that is played in an enclosed room surrounded by four tall walls. Players can either play singles or doubles, sort of like in tennis. The front wall includes a tin at the bottom, about a foot high that acts like a net in tennis; any ball hits the tin is dead and the point is awarded to the other player. The front wall is also the service line, indicating the point above which the ball must hit on the serve but only for that serve. The entire back half of the floor is split into two large boxes indicating where the serve has to land. If it is served from the right it must land in the left box and vice versa. There is also a marked spot where players must stand while they serve. Finally, there are red lines that run along the top part of each wall and any ball that goes above those is considered dead and the point is awarded to the other player. Darien plays its games to 11 which mean players must win by 2 points and it is usually the best three games out of five to decide the match. 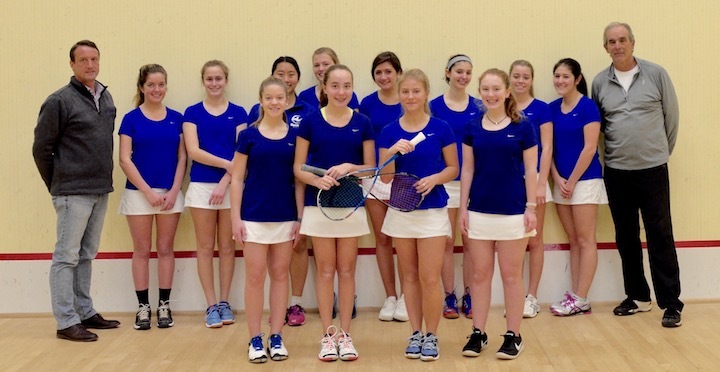 The Darien High School Squash team has always been our school’s little secret. Because the team does not practice or compete on DHS’s campus, sometimes the team gets forgotten in all of the Blue Wave Pride of other winter sports. However, after ending the 2011 winter season 42nd in the nation this year the Boys Squash team is no mediocre team and hopes to make top 30th in the nation. Dom along with senior captains Jonathon Gill and DJ Brown has high hopes for the team this year. “Fortunately, we did not lose many people so we hope to be successful by working hard and improving our skills,” said Hansford. Hansford is excited to finish off his last year of squash at DHS and this year will be practicing and competing with his freshman brother Toby who may just beat his older brother. Make sure to follow the Hansford boys and the rest of the team this season on the sports blog. 2011 Girls Squash team at the biggest tournament of the year, High School Nationals. As Darien High School’s athletic winter season quickly approaches, DHS’s very own squash team anxiously awaits. Among one of the newer sports to be offered at DHS, squash may not receive the yearly hype of Boys Hockey or Girls Basketball. However, with over 60 students trying out for the team this year, there is definitely something to be excited about. Since its existence, DHS squash has shown impressive growth, each year with more players and greater strength. The once 12-person team has now grown five times the size in a span of seven years. For all DHS squash players, this season includes some new changes and even greater opportunities. Due to limited court space, members of the squash team do not practice in unison, but are rather split up into practice groups who practice at different times. In previous years, the squash team has solely practiced at Squash Alley, a Stamford squash facility with 3 courts. However, this year, practice groups are split between two facilities, Squash Alley and Chelsea Piers in Stamford, a facility with far more courts than Squash Alley. With an additional practice facility, players will now be able to practice about a third more time than players last year. With significantly more practice time, players are looking to greatly improve their skills and lead the team to a successful season. DHS squash also welcomes a new addition to the team: Simon Little, the new official coach. This will be the first year DHS has had an official squash coach. In addition to coaching provided by fellow players and parents experienced with the game, players will be coached by Mr. Little at away games. “I am so excited to finish my final season knowing there is a great legacy behind me,” said senior and Girls Squash captain Althea Perley. The team has already held one week of tryouts prior to Thanksgiving break and is now in the midst of another tryout week. Come cheer on the team at their first competition, the Fairwest Jamboree, held at Yale on December 15th at 9:00AM! 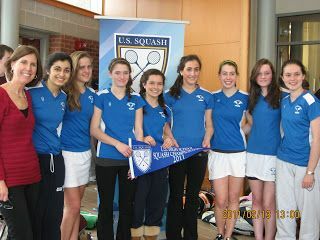 Squash Varsity B team at the annual end-of-the-season Nationals. As the Squash winter season has come to a close, it is now time to look back on the team’s highlights. This year, the DHS Squash team started stronger than ever, having a record 44 players and sending five teams to Nationals. For Squash, it was the first time players were cut from tryouts. Throughout this season, all players had the chance to play in matches, traveling to private and public schools across Connecticut and New York. For the top 20 players, tougher matches were played against Greenwich Academy, one of the top U.S. 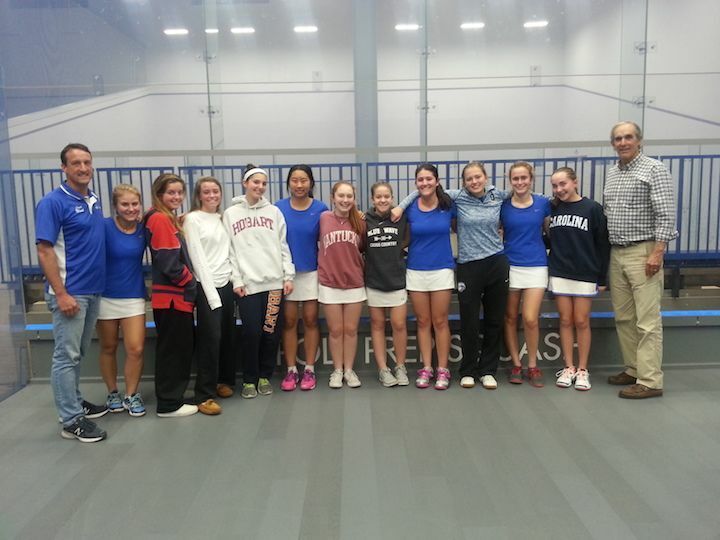 Girls teams in the nation, as well as Choate Academy and Street Squash. Lower- ranked players also had the chance to compete, facing schools such as Bronxville High School and New Canaan High School. The Darien Girls team also competed against schools like Rye High School. Darien girls ended victorious, winning three out of their four matches. U.S. Squash Nationals, the weekend of February 3-5th, marked an important event of the year. However, this year proved to be one of the hardest so far. Competing against a wide range of competitive schools from around the nation, most teams struggled to win the majority of their matches. One player said, “I thought the challenge at Nationals was perfect. It pushed us to work hard and improved our skills.” Although Darien may not have won Nationals, the season was a positive one for the players, coaches, and parents. For all, this season was noted as a progressive, team-building year. With only six seniors graduating from the team, DHS Squash is on the rise as one of the most prominent public high school squash teams in the nation. Upcoming contests for the team include private school invite matches, the most notable of which will be held at Brunswick in January. The squash team is currently in the midst of an exciting season and hopes to carry this energy into the remainder of the season and ultimately Nationals in February. “So far the team has performed admirably, and we are consistently winning matches which is what we’re looking for. We have a few more matches against private schools coming up, and most importantly, Nationals is on the 1st weekend of February,” senior captain Kincade Webster said. Webster is confident in the team’s performance and talent as they have, for the most part, been excelling in competitions. 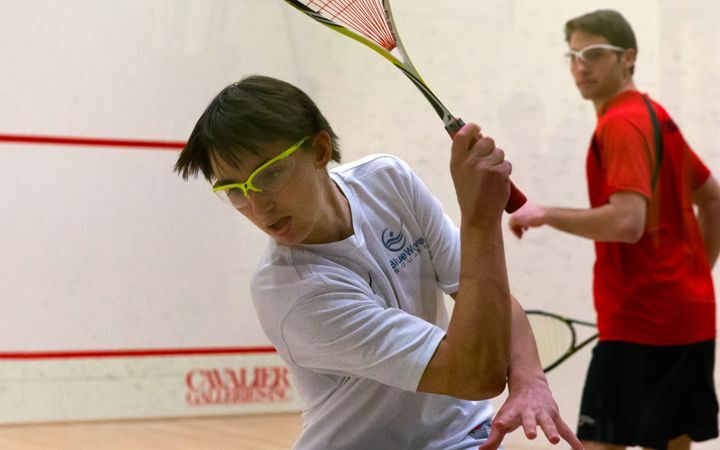 As the team’s schedule begins to get tougher with upcoming matches against Rye High School, Choate and other top teams at various jamborees, the Darien Squash Team is driven to maintain its high standing and level of recognition. “The goal for this season has always remained the same - perform well at Nationals. It’s the biggest tournament of the year and whether or not we play well and place well determines if we get invites to private school matches later this year and next year. We are looking to train hard in preparation, and make an impact at Nationals,” Webster said. The squash team will be tested at the National High School squash tournament held at the Yale Brady Squash courts and various other premiere squash venues throughout Connecticut. This competition is annually the largest squash tournament in the world. The team hopes to maintain its ranking from last year’s season and remain the #1 public high school in the nation for squash. Many students closely follow major winter sports such as hockey and basketball. However, another game is slowly gaining traction at Darien High School. Squash is a sport rarely associated with public schools, but the DHS squash team has done a great deal to change that perception. Ranked as the number one public school team in the nation, the team looks to retain that classification and make headway against stronger private schools. Leading the charge are junior stars Jonathan Gill and Dominick Hansford as well as senior captain Kincade Webster. Although the team has lost seven seniors, Webster remains positive, “We've got a young team, as there’s only 1 senior in the top 7… but that is in no way going to hold us back as we push hard through the year.” Juniors make up the bulk of the varsity squad, as no underclassmen are currently starting. According to Webster, the primary long term goal for the team is improving its divisional ranking at Nationals in February. The team kicks off the season with a match against Greenwich Academy on 11/30 at 3:30 PM. A more in depth profile of the team can be found in the upcoming January edition of Neirad. Junior Jonathan Gill does it all. He started on the Boys Varsity Soccer team, maintains good grades as an honor student, and this year he plans on leading the DHS Boys Squash team to FCIACS as well as States, just like his twin sisters Madeline and Leslie Gill did last year for this girls. Jonathan got started at a very young age. His dad played for 40 years so when Jonathan was old enough to walk, a squash racquet replaced toys. He has been playing for 9+ years now and it certainly has paid off. As of right now, Gill is ranked 2nd in the country in the Boys U17 bracket and 10th in the Boys U19 bracket. Not to mention, he is the star player for the Darien Squash team! So how is this sport played? Squash is similar to racquetball. Basically, one hits a ball against a wall, and has to retrieve an opponent’s shot within one bounce. There are various ways to improve, such as drills to improve power and accuracy, and sprinting to boost stamina. In the aftermath of nationals (2/11/11-2/13/11), the Darien High School varsity squash team voted on its captains for next year’s season. After tallying votes from March (3/19/11), the numbers revealed that captains for next year’s varsity co-ed team will be junior Kincade Webster, sophomore Dominic Hansford, and fellow sophomore Jonathan Gill. Captains for the girl’s squash team will be Jena Fritts, Holly Gordon, and Aastha Narula. Considering the varsity team’s loss of 7 of its top 9 players (on account of them being seniors), the team could be crippled for next season. However, hopes are high for the squash players with their nationally ranked captain Jonathan, who is currently number 7 in his age group of boys from age 15-16; Future captain Kincade remarked, “I'm hoping that with a young team we can still make an impact on nationals.” Next year, the varsity squash season will begin the week after Thanksgiving. Although a starter for Darien’s Field Hockey Dynasty, Senior Leslie Gill will be playing Squash at UPenn. Alex Iqbal, also a member of the field hockey team, will attend Wharton. Parker Lange, a rower at Maritime Rowing Club in Norwalk, will be taking his mad flow down to Penn to be a part of its crew team. He too has been accepted into Wharton. The varsity squash team made a name for themselves this past weekend as they served their way through the U.S. High School Squash National Championship to become the 2010 Division III Consolation champions. 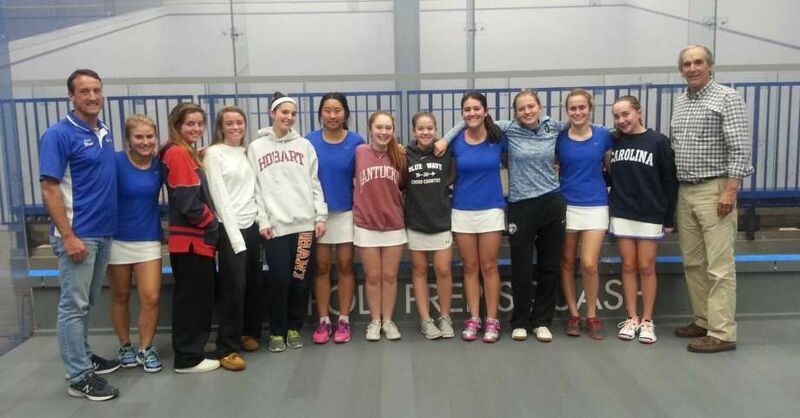 Darien's varsity team had a rough start losing its first match 6-1 in matches against Episcopal Academy JV team, but in the first round of the consolations, were victorious against Pomfret Academy 5-2 in total matches at the championship held on the Choate Rosemary Hall campus Feb 5-7. Tabor Academy posed a challenge to Darien, but Varsity Team A prevailed with a close triumph of 4-3. Senior Captain Britt Gordon came back 2-1 in the match versus Tabor Academy, winning by two points in the fifth and final set, with a score of 11-9. Senior Zac Calahan and Junior Malcolm Willis defeated their opponents in the fifth set of their matches versus Tabor as well. Darien Team A also vanquished Salisbury Academy in which Darien won five out of seven matches to win the consolation championship. Junior JV member Robbie Florian was satisfied with the team’s performance. “The team overall has made a great improvement since last year. I’m really proud of everyone,” Florian said. Whereas Darien's A Team only won one match last year at nationals, this year they are consolation champions of Division III. After a disappointing season as a first-year varsity team last year, the Varsity Squash team is a new and improved group this year and on its way to success. The team is currently #32 in the nation, and as Nationals are coming up, the team is looking forward to an excellent performance.